A lineup featuring some of rock's biggest artists has been announced for the fifth annual Monster Energy Fort Rock, Saturday, April 29 & Sunday, April 30, 2017 at JetBlue Park in Fort Myers, Florida. 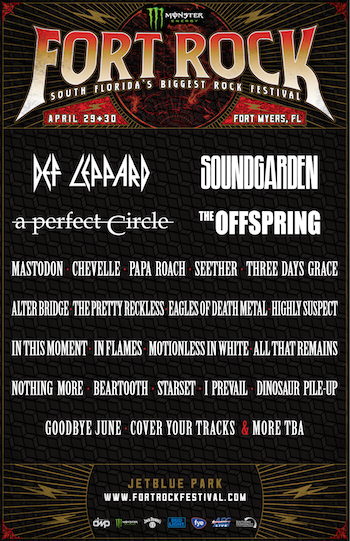 South Florida's Biggest Rock Festival will be led by Def Leppard (Saturday headliner), Soundgarden (Sunday headliner), and A Perfect Circle, and will feature performances from over 25 bands on two stages, including The Offspring, Mastodon, Chevelle, Seether, Papa Roach, Three Days Grace, Alter Bridge, and more. "We are thrilled to return to Fort Rock — Florida crowds are some of the best in the world!" "Fort Rock festival is coming again guys! Hailing from Chicago, IL, we always look forward to heading down south to Florida to warm up, stretch our legs and hopefully still head bang our way right into, or right through your hearts! Yes indeed, we will see you soon!" "We're stoked to be kicking off the World's Loudest Month at Fort Rock with Alter Bridge. It's gonna be epic so don't miss it!" "Fort Rock turns 5 this year, and South Florida's biggest rock 'n' roll getaway is only getting bigger! The hottest acts in rock and metal today get to share the bill with absolute legends like Def Leppard, Soundgarden, A Perfect Circle and The Offspring. We can't wait to party and kick off the World's Loudest Month by celebrating five years in South Florida at JetBlue Park this April," says Clay Busch, Vice President of Marketing and Strategic Partnerships for festival producer Danny Wimmer Presents. Monster Energy Fort Rock is produced by Danny Wimmer Presents and AEG Live and kicks off the annual World's Loudest Month festival series. The festival is fueled by Monster Energy. Additional 2017 sponsors include: Bud Light, Jack Daniel's, and FYE, with more to be announced. Since 1993, music industry veteran Danny Wimmer has been producing concerts and festivals, both large and small. In 2011, he formed Danny Wimmer Presents, which now produces several of the largest rock and alternative festivals in the U.S. By combining A-list talent with local cuisine and culture, DWP has become recognized within the industry for delivering the highest-quality entertainment experiences to fans, artists, sponsors, partners and host cities. DWP creates memorable and all-encompassing festival experiences, leaving both consumers and partners with lasting and meaningful impressions. With 580,000 fans attending all DWP festivals in 2015, and 10 billion media impressions, DWP will continue to add new music festivals to its already stellar portfolio, which includes Rock On The Range, Monster Energy Aftershock Festival, Monster Energy Welcome To Rockville, Monster Energy Carolina Rebellion, Louder Than Life, Chicago Open Air, and Monster Energy Rock Allegiance, among others.